Sitting at my desk in Minnesota, snow quietly falling, creating a hush over everything, I can only imagine what being in the streets of Cairo must be like right now. As a woman of European descent, living a fairly privileged life, I can only wonder what the struggle for freedom means for one of the oldest cultures in the world. Our realities are separate; I know that. But we are also connected. There is a spirit to this uprising and a universal longing for justice in it, that I understand. Sometimes, images and sounds from half way across the world can reach across our differences and tell us about common dreams. In those times I begin to hope that change is possible. And even though the uprising in Egypt is inspiring, I send prayers that the struggle ends soon with peace and freedom instilled into their daily lives. We live in revolutionary times. 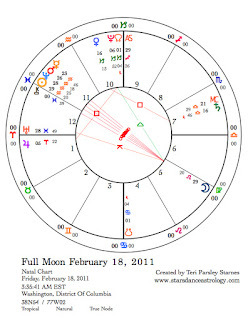 Astrological patterns of the moment support this. We are on the cusp of change. I choose to approach this change in the most conscious way I can, while learning my part in creating the world I dream of. Being a revolutionary. I am not an expert, but it makes sense to me that the root of revolution must be in living an authentic life—whether that life is a quiet one tending the home and raising children; a public one of organizing and meetings; an interrupted life, when revolution is thrust upon us; or a confrontational, challenging life of asking hard questions and holding leaders accountable. There are many ways to be a revolutionary, but all of them include self-reflection so that we may know our true selves and our responsibility in making the world we dream about. Perhaps there is a cosmic scale we are meant to weigh ourselves in. On one side we fill the scale with the answers to these questions: What is my authentic truth? How do I live in accordance with that truth? On the other side of the scale, these questions reside: What is the authentic truth of those who are not like me? How do I make room for or reach across the differences of other individuals, nationalities, races and classes, who are very different from me? When I shift awareness to another point of view, I see my own inherent contradictions and paradoxes more clearly. Knowing others leads me to knowing myself. Knowing myself, I become a revolutionary. 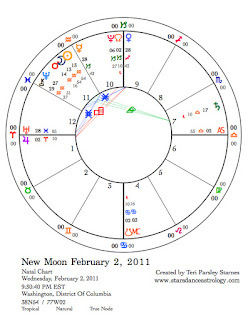 The New Moon in Aquarius invites us into a practice of self-knowledge and revolution. This lunar month begins with the electric energy of Aquarius—pouring forth a fountain of fresh ideas and inspiration. The lunar month ends with the release and reverie of Pisces filling our hearts and erasing divisions—needed balm for our souls. 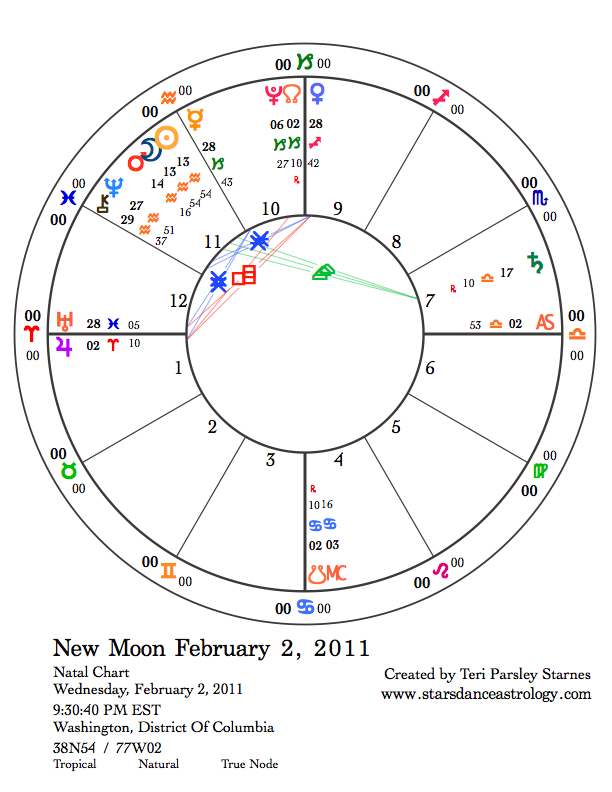 The New Moon chart sets the pattern for this month. The Sun and Moon are conjunct Mars. Mars in Aquarius is the White Knight charging in to save the day, especially if the means of salvation can be novel and unexpected. This Mars has great zeal to instigate change. The grounding trine to Mars from Saturn will hopefully give us the focus we need to act effectively. The ruler of Aquarius, Uranus, is square to Venus. If Mars is the Knight, Venus is the Lady of Inspiration. The Star card in Tarot represents Aquarian inspiration pouring down. If that cup of inspiration has felt dry over the past few weeks, now it begins to flow with the anticipation of change coming our way. The sky stories. Everything around us tells a story. The stars are no different. In fact, they are especially good at telling stories that reveal important things about being human. Every New Moon is an opportunity to re-story our lives inspired by the stars. Are you being moved to take heroic action? Do you long for change? Are you searching for your authentic truth? Are you ready for an outpouring of inspiration? The transits this month involving Mars tell a story about the hero of change, his challenges, lessons, and transformations as the energy of Aquarius gives way to Pisces near the end of this lunar cycle. The transits involving Venus are about inspiration, which deepens in the first part of the month and then at the end bursts from the overflowing cup when Venus enters Aquarius. The shift from Aquarius to Pisces emphasizes taking ideas and inspirations from the head space to the heart space. 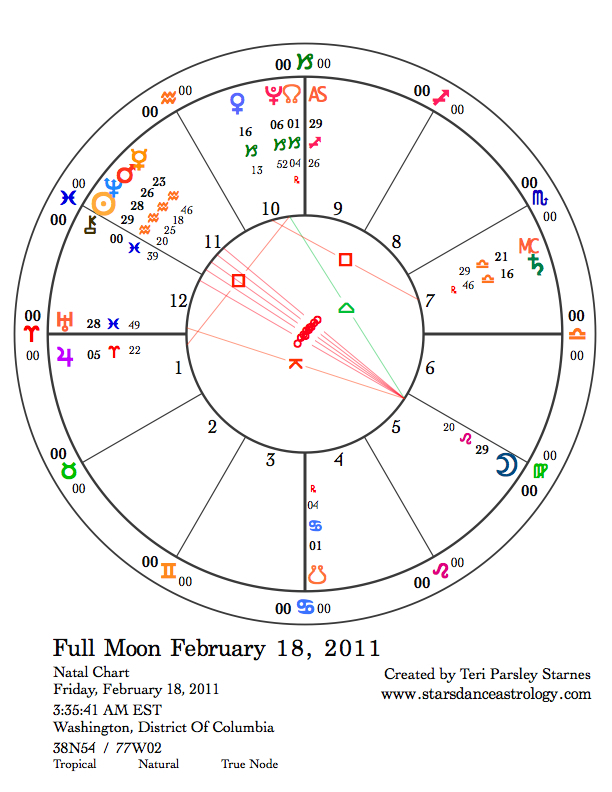 The Full Moon on February 18 happens on the cusp of Aquarius and Pisces. Cusps are doorways holding equally what is passing and what is to come. This liminal space is a time to open consciousness—to feel the paradox that leads to illumination. Two squares are added to this energy, making it interesting and potent. Jupiter in Aries squares Pluto in Capricorn. Jupiter expands; Pluto reveals. This Full Moon has the potential to reveal secrets. The revelation contributes to the revolutionary energy of these times. Saturn in Libra squares Venus in Capricorn. This is the energy of deepening our source of inspiration. Every inspiration carries a responsibility to that beauty. Commitment creates possibility. Next month, Uranus enters Aries for the next seven years. There will be no spectators; every one of us will all be called on to become revolutionaries. The stirrings of truth and self-knowledge we experience this month have the potential to teach us important things about this journey.